The working week should be cut to 21 hours to help boost the economy and improve quality of life, a left-wing think tank has said. The New Economics Foundation claimed in a report the reduction in hours would help to ease unemployment and overwork. 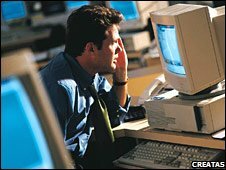 The think tank said people were working longer hours now than 30 years ago even though unemployment was at 2.5 million. The foundation admitted people would earn less, but said they would have more time to carry out worthy tasks. They would have better scope to look after children or other dependants, there would be more opportunity for civic duties, and older people could even delay retirement, it said. Anna Coote, co-author of the 21 Hours report, said: "So many of us live to work, work to earn, and earn to consume, and our consumption habits are squandering the earth's natural resources. "Spending less time in paid work could help us to break this pattern. We'd have more time to be better parents, better citizens, better carers and better neighbours. "We could even become better employees - less stressed, more in control, happier in our jobs and more productive. "It is time to break the power of the old industrial clock, take back our lives and work for a sustainable future." The foundation's policy director Andrew Simms added: "A cultural shift will throw up real challenges, but there could also be massive benefits for our economy, our quality of life and our planet. "After all, hands up who wouldn't like a four day weekend?"